I didn’t stretch this painting because the paper is so thick it doesn’t buckle when wet. If you look closely, you can see the pencil marks on the paper. I always like to start with a pretty detailed drawing of what I am going to paint. I started adding color to this painting in the sky, and after like 3 or 4 washes, I achieved the color and value I wanted. I finished the sky area so I could judge each successive area of the painting against the sky to see if I need to do more in the area to build it up to the same level of completion. 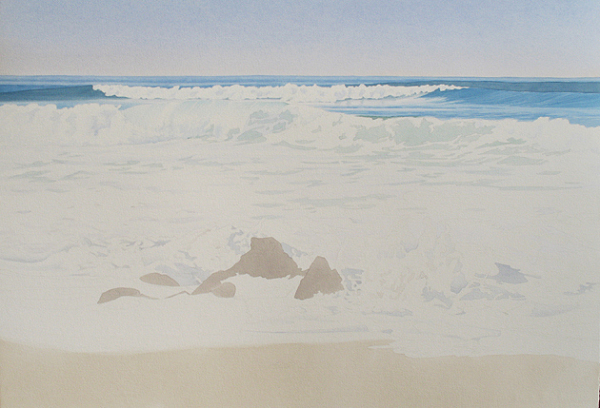 The painting is from a few photos I took on a pretty sunny winter day in San Diego at Windansea. I didn’t stretch this paper because it is 300lb paper, and doesn’t buckle when wet. If you look closely, you can see the pencil marks on the paper. I always begin with a pretty detailed drawing of what I am going to paint. I started with the sky, and after like 3 or 4 washes, I achieved the color and value I wanted. I finished the sky area so I could judge each successive area of the painting against the sky to see if I need to do more in the area to build it up to the same level of completion. 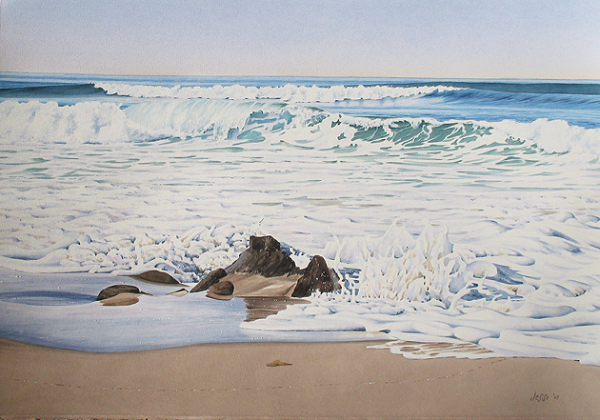 This is painted from a few photos I took on a sunny winter day at Windansea. I am a pretty careful painter, and I plan on using a lot of washes to build up a painting to a level of completion I like. 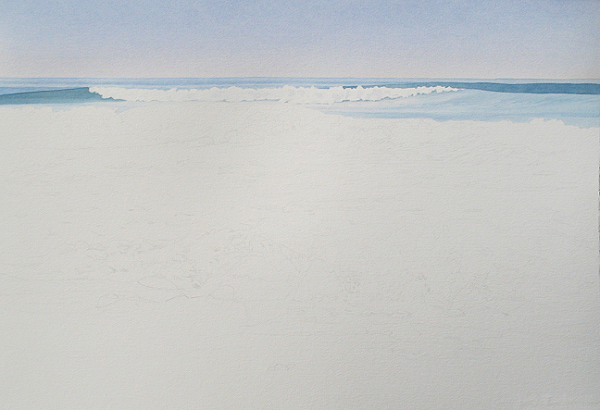 The first few washes are used just to establish where I want the colors to go. It is like filling in a map of the painting. In this third step, I start to add thicker paint and begin to build up color - while watching the values closely. I make subtle adjustments to the color on each wash, trying to get the best result. 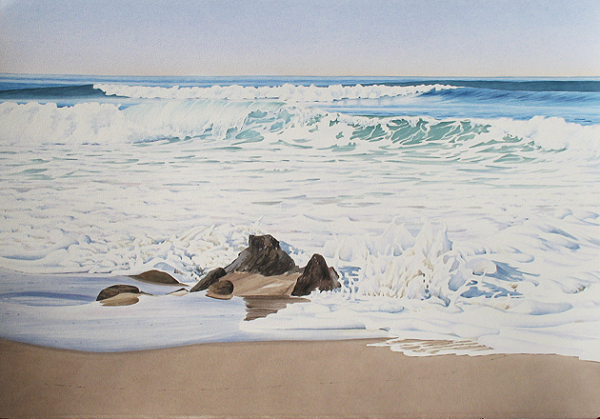 One of the challenges of this painting is that it has a lot of whitewater in it, and I need to define the movement of the water with color and still make it look white. No white pigment was used to get the color of the aerated water. It is the white of the paper left blank. ​The values are getting darker, and the colors are being adjusted. I work on the whole painting to bring it all up together at the same time - judging it against the finished sky. This shot is more of the same. I am amazed at how many different shades of purple I am using throughout the whole painting. The sky had a lot of purple in it. Especially since the sky that is showing is basically the horizon. It gets bluer as it gets overhead, but the horizon is very purple and way lighter in value than you would think when starting the painting. The whitewater is defined by other shades of purple. The reflection in the wet sand is purple - even the drier sand has a lot of purple mixed in it. I like when a painting at this point. It looks good, and I know I probably won't do anything to mess it up too bad. Up to this point, there is always a chance that I could do something to ruin everthing. This is the last step - almost. I have built the whole painting up to a level of completion I am happy with. The values match, and the colors are good. I finish it off with what I like to call dots and dashes. These are strong marks of almost pure color that add detail without drawing attention to themselves. I say I am almost done, because in a few days or weeks, I will look at the finished paintings with a fresh eye and see if there is anything else I need to do, or areas that need a little more attention. As I am writing this, I do see a few areas that could use a little more definition, so I’ll get to those, but basically the painting is done. Since it was painted on such heavy paper, I didn’t have to tape down the edges, and was able to paint on the whole sheet. This will allow me to have the painting “float” in the frame, showind the deckled edges. 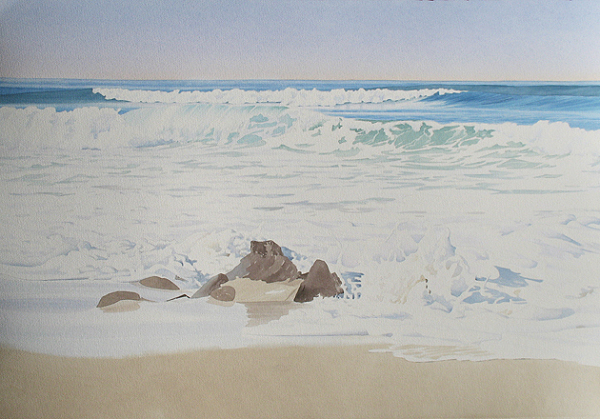 It is a nice way to present an original watercolor painting. I’ll put it in a 30 x 40” frame, and have it float over some canvas. It’ll look awesome.